Objective: To examine the wound healing properties of eicosane, pentadecane and palmitic acid by evaluating in term of anti-microbial, anti-inflammatory, proliferation, migration and collagen synthesis. Methods: Anti-microbial activities of Staphylococcus aureus, Bacillus subtilis, Escherichia coli and Pseudomonas aeruginosa were evaluated by carrying out disk diffusion and agar well diffusion methods. Growth rate of tested bacteria was also evaluated for 8 h in conjunction with the sample drugs. Besides, U937 cell lines were used as model study for realtime mRNA genes expression studies of TNF-α and IL-12 under the treatment. Proliferation, migration and collagen content synthesis were carried out on human dermal fibroblast. Results: None of the sample drugs possessed significant inhibition of bacteria tested in this study both in disk diffusion and agar well diffusion methods. In contrary, significantly low expressed mRNA gene expression levels of TNF-α and IL-12 were found under the treatment of respective drugs. Meanwhile in proliferation, migration and hydroxyproline content analysis, all the sample drugs showed no significant positive stimulation. Conclusions: This study therefore explains that apart from their potential in downregulating pro-inflammatory cytokines, these three compounds which were examined individually may not be good candidates in promoting wound healing. Foundation project: This project is supported by the Centre of Excellence for Research, Value, Innovation and Entrepreneurship Research Grant Scheme UCSI University (UCSI-CERVIE-RGS Proj-in-FAS 039). Skin plays an important role as human physical protective layer, covering and separating the vertebrates with external environments. It is composed of epidermis and dermis, which prevent the direct contacts with external environment factors, such as UV irradiation, pathogen and toxic components,. Underneath of skin is composed of blood vessels, connective tissues, nerves, hair follicle and fibroblasts, they support numerous of potent biological functions,. In nature, skin is vital to maintain and prevent excess loss of water and against exogenous pathogen. Skin pH is always maintained at below 5.5. Furthermore, keratinocytes at the outer layer of skin secrete antimicrobial peptides to control the habitat of colonization of skin microflora,. Wounds are defined as breakage of skin layer possibly caused by cuts, scratches or burn and characterized by heat, pain, erythema and edema. Once the tissue is damaged, healing process will be initiated. There are four stages in wound healing process: hemostasis, inflammation, proliferation and remodeling; whereby they are occurring orderly but with overlapping phases,. Throughout the healing cascade, damaged tissue, inflammatory cells and fibroblasts will interact and coordinate with each other. During hemostasis, platelet aggregates and forms clot at the damaged area. Then, they will further release growth factors and cytokines to attract immune cells such as neutrophils to the wounded area. Neutrophils are the first inflammatory cells that arrive at the wound area. They attack and combat pathogens by releasing reactive oxygen species meanwhile release inflammatory cytokines to attract macrophages. In fact, macrophages are responsible to phagocyte dead cells. Along with the inflammation, metabolites such as interleukin 1, transforming growth factor, epidermal growth factor and fibroblast growth factor are secreted and they are responsible for the formation of granulation tissue. After inflammation, proliferation, migration and remodelling will take place in the cutaneous layer and fibroblasts take the major roles. Fibroblasts received signal from chemotactic factors secreted by macrophages, and tended to migrate from adjacent tissue and repopulate around the wounded area. Fibroblasts from collagenous extracellular matrix secrete collagen and eventually mature into scars which are less cellular and vascular. This phase is categorized as remodelling, to restore maximal tensile strength of the wounded area. Concurrently, blood vessels are formed to restore the wounded site with blood supply, nutrients and provide trafficking for recruitment of cells. On the other side, if wounds are exposed to unsterile environment, there is high risk of getting infected by bacteria. The initiation of infection is due to bacteria overloading at the wounded site whereby they will secret large amount of pro-inflammatory cytokine to prolong the healing cascade. Hence, chronic wound will occur. To overcome the problem, agents that are able to protect the wound from infection and decrease the impact of inflammation towards the wound tissue are much needed. Approximately 70% of wound healing drugs are originated from plants. However, most experiments were done on crude extracts, whereby none of the wound healing properties studies was carried out on specific components from the potential crude extract. Eicosane, pentadecane and palmitic acid are pure compounds identified from LC-MS analysis of Labisia pumila dichloromethane crude extract whereby it has been proven that crude extract of Labisia pumila exerted potential wound healing properties such as anti-microbial and anti-inflammatory,. Eicosane and pentadecane are classified as alkane, whereas palmitic acid is saturated fatty acid. Interestingly, they are also commonly identified as major constituents in crude extract such as Taraxacum officinale, Coriandrum sativum, Hypericum hircinum, Acacia nilotica and Pentanisia prunelloides Walp. (Rubiaceae). These crude extracts of plants exerted anti-microbial and anti-inflammatory effect respectively,,,,. As eicosane, pentadecane and palmitic acid are the major constituents of the above crude extracts, this research study was mainly to investigate their roles in wound healing. Eicosane, pentadecane and palmitic acid were measured and prepared in two types of solvents which are distilled water (H2O) and hexane (Hex). Sample drugs which were dissolved in these forms were used in evaluating anti-inflammatory properties, effect on human dermal fibroblast (HDF), wound scratch assay and hydroxyproline content analysis. Four types of skin flora that consist of Gram-positive and Gramnegative such as Staphylococcus aureus (S. aureus), Bacillus subtilis (B. subtilis), Escherichia coli (E. coli) and Pseudomonas aeruginosa (P. aeruginosa) were obtained from Microbiology Laboratory of UCSI University Kuala Lumpur. They were maintained at 37 °C in aerobic condition for the usage of experiment in determination of the inhibition properties of eicosane, pentadecane and palmitic acid. Concentrations used for susceptibility test were adjusted at at least 10 μg/mL and did not exceed 100 μg/mL. Tested microorganisms were cultured at respective optimal temperature until it achieved turbidity of 0.5 McFarland standard. Bacterial suspensions were then spread on dried nutrient agar by using sterile cotton swab. To ensure the spreading was even, the agar plates were inoculated by streaking the swab throughout the agar surface for twice before the placement of disks onto the agar plates. The disks were loaded with 10 μL of respective drugs at different concentrations (10, 20, 30, 40, 50, 60 μg/mL) and allowed them to stand for 5 min. Chloramphenicol (30 μg/mL) was used as the positive control whereas distilled water was acted as negative control. All of the tests were carried out in triplicate. The inoculated plates were then incubated at 37 °C overnight before determination of zone inhibition. The inhibition zones were measured by ruler. Bacterial suspension was prepared at 0.5 McFarland standard. Sterile cotton swabs were used to inoculate the tested bacteria on the agar surface. Approximately 5 mm in diameter of wells were punched and created by 1 000 μL pipette tips. Then, 10 μL of drugs at respective concentrations were loaded into the wells. A total of 30 μg/mL of chloramphenicol (positive control) was prepared by diluting with ethanol whereas distilled water was acted as negative control. All of the tests were carried out in triplicates. The inoculated plates were then incubated at 37 °C overnight before determination of zone inhibition. The inhibition zones on respective plates were measured by ruler. Growth pattern of each bacteria strains was studied over 8 h. To start with the experiments, bacteria suspension was first standardized to 0.5 McFarland. One mL of bacteria suspension was added with 9 mL of drugs (final concentrations: 10, 20, 30, 40, 50, 60 μg/mL) and made up to final volume of 20 mL with culture broth. Tube that contained only bacteria suspension was acted as positive control whereby bacteria suspension incubated with hexane was a negative control. The absorbance readings at 600 nm were taken at every hour basis. U937 cell line is monocytic cells derived from human which is often used in the study of monocytes behavior and differentiation. U937 was cultured in Roswell Park Memorial Institute medium (RPMI 1640) (Nacalai tesque, Japan) culture medium supplemented with 10% fetal bovine serum, 100 mM sodium pyruvate, 200 mM L-glutamine and 100 U/mL penicillin/streptomycin. The cells were cultured in 37 °C with 5% CO2. U937 monocytic cells were differentiated into M1 phenotypes macrophages for subsequent anti-inflammatory study. To differentiate monocytic cells to M0 phenotype macrophages, 200 nM of phorbol 12-myristate 13-acetate (PMA) was added and allowed for 24 hours of incubation. Then, the cells were washed with 1 × PBS before being further stimulated by 100 ng/mL of lipopolysaccharides (LPS) and 20 ng/mL of interferon-gamma (IFN-γ). Forty-eight hours of incubation was needed to differentiate into M1 phenotype macrophages. RNA extraction prior of gene expression study was carried out according to the manufacture protocol of R&A-BLUE™. Total Extraction Kit. Cells were harvested and centrifuged at 200 g for 5 min. Supernatant was discarded and 1 mL of 1 × PBS was used to dissolve and wash the cell pellet. Next, R&A-BLUE™ lysis reagent was added to the washed cell pellet and dissolved it by repeating pipette. A total of 200 μL of chloroform was then added into the mixture and vortexed vigorously for 15 s before being centrifuged at 13 000 rpm for 10 min at 4 °C. Approximately 350 to 500 μL of upper aqueous layer was transferred into new microcentrifuge tube. Next, 400 μL of isopropanol was added and mixed well by inverting the tube for 6 to 7 times. Centrifugation at 13 000 rpm for 10 min at 4 °C was performed and supernatant was removed without disturbing the cell pellet. Then, 75% ethanol was added and mixed well by inverting the tube 4 to 5 times for washing. RNA pellet was observed after centrifugation. The pellet was then dried for 5 min before being dissolved in 50 μL RNase free water. Extracted RNA was kept in -80 °C for subsequent quantitative analysis. RNA was converted into cDNA before subsequent reverse tracribe real-time polymerase chain reaction (qPCR) was performed using Maxime RT-PCR premix (iNtRON, Korea). Briefly, 1 μg of total RNA was calculated and added into the premix tube, topped up to 20 μL with nuclease free water. The reaction was incubated at 45 °C for 1 h and terminated at 95 °C for 5 min. The synthesized cDNA was then added with 20 μL of nuclease free water and stored at -20 °C. Expressions of TNF-α and IL-12 by qPCR were used to validate the successful M1 polarized macrophages whereas M1 macrophage is defined as macrophage that encourages inflammation. Specific primers for TNF-α and IL-12 were shown in [Table 1] whereby GAPDH specific primers acted as housekeeping gene,,. Table 1: Specific primers for M1 polarized macrophages validation. Anti-inflammatory properties of eicosane, pentadecane and palmitic acid were analyzed by determining their ability to reduce the pro-inflammatory cytokines (TNF-α and IL-12) gene expression. U937 cells were treated with 200 nM PMA for 24 h to differentiate into M0 phenotype macrophages. Then, eicosane, pentadecane, palmitic acid (H2O and Hex) respectively were treated to the cells at concentrations of 10 and 70 μg/mL for 48 h before induction by LPS and IFN-γ for another 48 h. There were three control groups which labelled as 1) M1 (successful induced macrophages); 2) 10% hexane (similar amount of hexane used to dissolve sample drugs); 3) control (Cells without LPS and IFN-γ treatment). Next, RNA extraction and cDNA synthesis were performed as described in 2.5.2 and 2.5.3. The quantitative analysis involved two-step qRT-PCR. 5×HOT FIREPol® EvaGreen® qPCR Supermix (Solis Biodyne, Estonia) was used for gene expression study, using StepOne Real-time PCR System (Applied Biosystems, USA). The mRNA expressions of all samples were normalized to housekeeping gene, GAPDH. The mRNA content was calculated for each sample relative to GAPDH by using 2-ΔΔCT. Cycle threshold (CT) value is the number of PCR cycles required to generate sufficient fluorescent signal to achieve the defined threshold. Data obtained were tabulated according to (1/×) equation. HDF was purchased from Department of Tissue Engineering Medical Centre of University Kebangsaan Malaysia (UKM). Advanced Dulbecco's Modified Eagle Medium-F12 (DMEM-F12) (Gibco, USA) supplemented with 10% fetal bovine serum was used to culture the HDF, at 37 °C with 5% CO2. To determine the effect of sample drugs towards the HDF cell viability, 3-(4,5-dimethylthiazol-2-yl)-2,5-diphenyltetrazolium bromide (MTT) assay was employed in this study. MTT assay is an ordinary biological tool used to examine the cell viability of fibroblast as well as toxicity of the drugs,. Before the commencement of assay, HDF was counted and seeded at density of 1 × 104 cells per well in 96-well plate. The cells were given 24 hours for attachment before treatment. Next, HDF was treated with eicosane, pentadecane and palmitic acid at 10, 20, 30, 40, 50, 60, 70 μg/mL concentrations. Controls were (1) medium only (blank), (2) cells and medium (positive control) and (3) cells and dimethyl sulfoxide (DMSO) (negative controls). Equation [(Asample-Blank)/ Apositive control) × 100%] was used to calculate the percentage of cell viability. Negative control was used to make sure the cells are not viable and it was not included in any calculation or graph displayed. All of the experiments were carried out in triplicate. MTT assay was carried out after 48 hours of incubation time. Absorbance at 570 nm with the reference of 630 nm was measured by spectrophotometric microplate reader (Bio-Tek, USA). This assay was aimed to determine the ability of HDF to migrate across an artificial wound after the treatment of drugs. HDF was counted and seeded at density of 2 × 105 cells per 40 mm2 culture dish and allowed to grow until confluent. An artificial wound was created vertically at each dish by scratching across the monolayer of cells using 200 μL pipette tips. Cell debris was then washed away by 1 × PBS. Fresh medium containing drugs with their final concentrations (10, 30, 50, 70 μg/mL) was added to the cells. Culture dish without any treatment was acted as control. Next, culture dishes were viewed under AxioVert.A1 fluorescence microscope (ZEISS, Germany). Indicators were drawn on the culture dishes to indicate the examined wound scratch areas. Black and white pictures were captured and saved at 0, 24, 48 and 72 hours. Three different points on the same area of wound scratch were recorded. Distances between the scratches were measured and indicated by using the ZEISS software. Rate of migration was calculated based on the values obtained. Hydroxyproline is a positive biomarker of collagen content as it is the product hydroxylation of amino acid proline during the key translational step,. 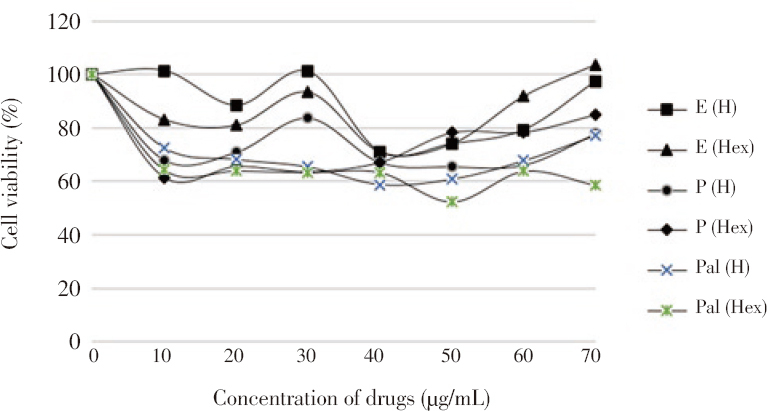 To measure the effect of sample drugs towards the production of hydroxyproline, HDF was cultured and treated with various concentrations of drugs (10, 30, 50, 70 μg/mL) for 72 h. The cells density was standardized throughout the experiment. Next, 100 μL of cultured medium was pipetted carefully and mixed with equal amount of hydrochloric acid. The suspension was then heated at 100 °C for 3 h. After that, 50 μL of the solution was transferred into 96 well plate and dried in oven at 50 °C overnight. Above steps were done prior to hydroxyproline content analysis. After overnight drying, 100 μL of chloramine T/ oxidation buffer was incubated in each dried sample for 5 min at room temperature. Then, 100 μL of diluted 4-(dimethylamino) benzaldehyde reagent was added into the mixture and incubated for 90 min at 60 °C. After that, the plate was sent for absorbance reading at 560 nm using FLUOstar Omega microplate reader (BMG Labtech, Germany). All the assays were carried out in duplicate and concentration of hydroxyproline contents was referred to standard curve prepared earlier. All data collected were subjected to One-Way ANOVA statistical analysis. Data were accepted as significant difference at P<0.05. For quantitative qPCR results, the data were described as the fold change from the control group with significancy when P value was less than 0.05. The ability of eicosane, pentadecane and palmitic acid to inhibit the growth of Gram positive and Gram negative bacteria was tested on both disk diffusion method and agar well diffusion method. All the drugs at various concentrations did not show any inhibition zone on S. aureus, B. subtilis, E. coli and P. aeruginosa. 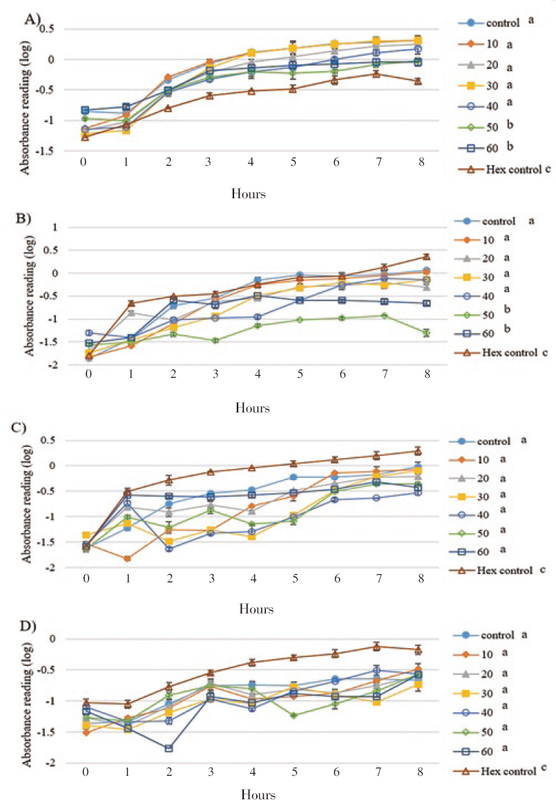 Positive control (chloramphenicol) at 30 μg/mL managed to produce inhibition zones of 21 mm (S. aureus), 22 mm (B. subtilis), 22 mm (E. coli) and 15 mm (P. aeruginosa) whereas negative control did not show any inhibition zone. Since eicosane, pentadecane and palmitic acid did not demonstrate complete killing effect on skin flora, these drugs were introduced to study their effect on bacterial growth. 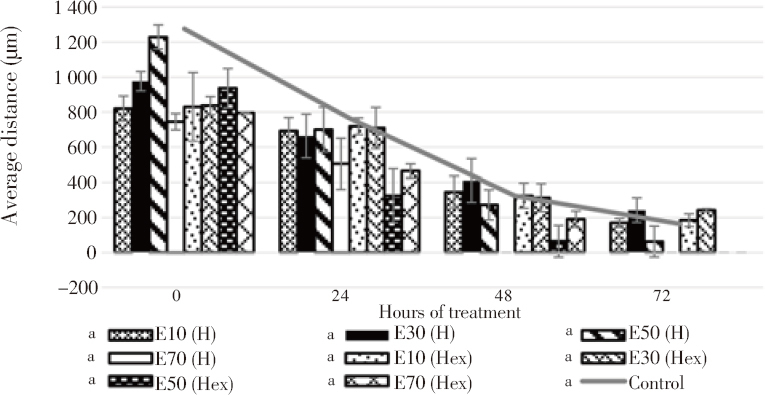 As shown in [Figure 1], the growth rate of B. subtilis was the lowest with 50 μg/mL of eicosane especially at 3rd hour. Besides, eicosane at concentration of 50 and 60 μg/mL had significant inhibition in S. aureus's growth rate compared to control (only bacteria suspension). In addition, [Figure 2] also demonstrated that pentadecane at 60 μg/mL showed significant inhibition on all tested bacteria species, especially a sharp decrease at 5th hour on E. coli. 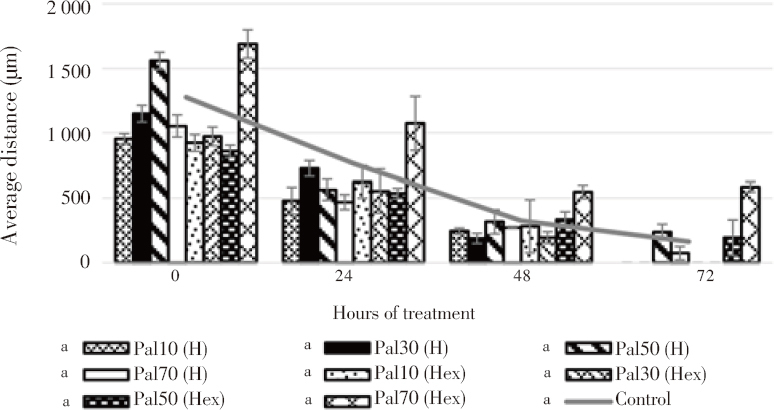 On top of that, growth rate of both B. subtilis and E. coli were influenced by the treatment of palmitic acid at 4th hour with concentration of 60 μg/mL [Figure 3]. Although there were decreases at different time points, bacteria continued to grow and no significance difference was observed as compared to positive control (only bacteria suspension). Figure 1: Influences of eicosane on bacterial cell growths A) S. aerues B) B. subtilis C) E. coli D) P. aeruginosa throughout the 8 hours of incubation. Concentration unit: μg/mL; The groups not sharing a common letter (a, b, c) are significantly different between groups (P<0.05). Figure 2: Influences of pentadecane on bacterial cell growths A) S. aerues B) B. subtilis C) E. coli D) P. aeruginosa throughout the 8 hours of incubation. Concentration unit: μg/mL; The groups not sharing a common letter (a, b, c) are significantly different between groups (P<0.05). Figure 3: Influences of palmitic acid on bacterial cell growths A) S. aerues B) B. subtilis C) E. coli D) P. aeruginosa throughout the 8 hours of incubation. Concentration unit: μg/mL; The groups not sharing a common letter (a, b, c) are significantly different between groups (P<0.05). To elucidate the inhibitory effect of eicosane, pentadecane and palmitic acid on pro-inflammatory cytokines production upon LPS stimulation, the mRNA expressions of TNF-α and IL-12 were examined after 48 hours of pre-treatment followed by another 48 hours of induction. 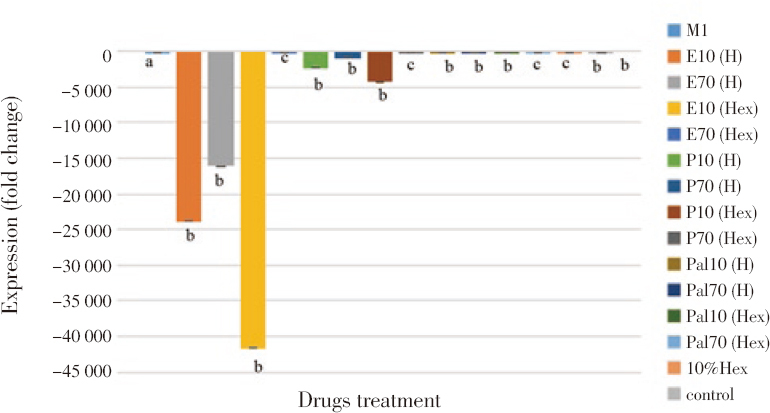 As shown in [Figure 4], all LPS-treated groups with drugs (pre-treatment) significantly decreased the TNF-α mRNA expression as compared to LPS-treated group. The SD values calculated in [Figure 5] were very small and hence they were barely shown in the figure itself. Among them, pentadecane (hexane) and palmitic acid (H2O) showed the most significant TNF-α gene inhibition at concentration of 10 μg/mL and 70 μg/mL respectively. 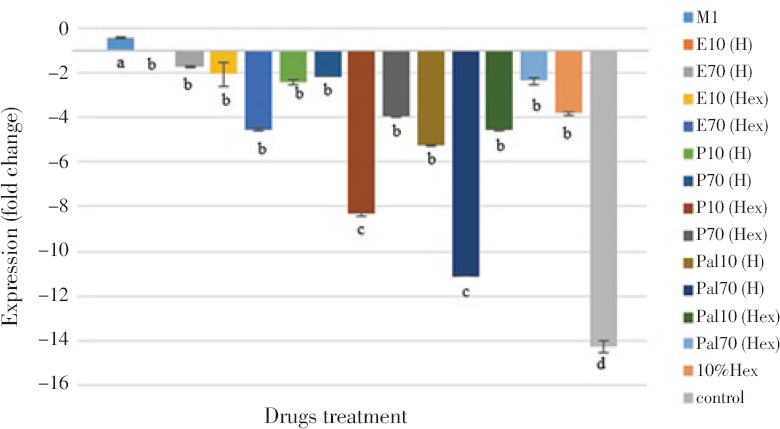 Besides, it was found that all dosages exerted great impact on downregulating the expression of IL-12 as compared to LPS-treated group shown in [Figure 5]. However, eicosane, pentadecane and palmitic acid (hexane) at concentration of 70 μg/mL had no significance difference with control group (10% hexane). In this situation, hexane may have caused minor inflammation to the macrophages. Figure 4: Relative TNF-α gene expression measured by real-time PCR. Values were expressed as mean ± SD. The values have been normalized to matched GADPH measurement. The means not sharing a common letter (a, b, c, d) are significantly different between groups (P<0.05). Hex = Hexane; H = H2O. Figure 5: Relative IL–12 gene expression measured by real-time PCR. Values were expressed as mean ± SD. The values have been normalized to matched GADPH measurement. The means not sharing a common letter (a, b, c) are significantly different between groups (P<0.05). Hex = Hexane; H = H2O. The outcomes of the MTT assay after 48 h showed an average percentage of viability between 58% and 103% as shown in [Figure 6]. Fibroblast cells treated by eicosane and pentadecane had averagely higher cell viability as compared to those treated with palmitic acid. Basically, palmitic acid at 50 μg/mL showed the lowest cell viability among the tested outcomes. Figure 6: Percentages of HDF that is viable in the presence of eicosane, pentadecane and palmitic acid. Hex = Hexane; H = H2O. The migration properties of eicosane, pentadecane and palmitic acid were assayed by using wound scratch method. As shown in [Figure 7] and [Figure 8], fibroblasts treated with higher concentrations of eicosane and pentadecane enhanced their migration rate. Based on the results, the average distance (pm) between the gaps became zero indicated that fibroblasts fully migrated across the wound and no gaps were found. However, the results were not significant as compared to control group. In [Figure 9], fibroblasts treated with palmitic acid had tendency to slow down the migration rate at high concentrations. Figure 7: Averaged distance between the edges of wound scratch treated by eicosane for 72 h.
Values were expressed as mean ± SD. The means sharing a common letter (a) are not significantly different between groups (P>0.05). Hex = Hexane; H = H2O. Figure 8: Averaged distance between the edges of wound scratch treated by pentadecane for 72 h.
Figure 9: Averaged distance between the edges of wound scratch treated by palmitic acid for 72 h.
Hydroxyproline contents released by each treatment group were calculated over the percentage of non-treated group as shown in [Figure 10]. Fibroblasts did not produce a significant increase in hydroxyproline content along with the increase of concentrations. Calculated SD values were very small which were not shown clearly in [Figure 10]. Figure 10: Concentration of hydroxyproline elicited by fibroblast after treatments. Values were expressed as mean ± SD. The means sharing a common letter (a) are not significantly different between groups (P>0.05). Hex = Hexane; H = H2O. When open wounds are exposed to external environments, the possibility for the wounds to get infected increases. The factor that determines the pathogenicity of infected wounds is mainly due to bacterial colonization with combined factors of host immunity and pathogenicity of bacteria. In this case, none of the sample drugs possessed killing effect on any bacteria, although palmitic acid is well documented that this fatty acid is potential in antimicrobial due to their broad spectrum sensitivity and has low resistance mechanisms against the actions,. However, to be a potential antimicrobial fatty acid, it highly requires them to present in acid form, unsaturated and with more than 14 carbons. Palmitic acid used in this study contained 16 carbons but in saturated form. Palmitic acid can be precursor for cis-6-hexadecanoid acid, a monounsaturated fatty acid secreted from sebaceous gland. Palmitic acid is completely the saturated analogue of cis-6-hexadecanoid acid hence it is hypothesized that unsaturation is responsible for the antibacterial activity. The results in this study were further supported by Nielsen et al. who published a negative results of palmitic acid against both Gram positive and Gram negative bacteria even though at concentration of 2 mM (512 μg/mL). It is also plausible that eicosane and pentadecane were not effective against all tested microorganisms because they are normally present in wax that protect the plants from physical damage and prevent water loss,. Although bacteria tested with pentadacane showed significant lower growth rate compared with non-treated group, but an intensive suppression of E. coli particularly at 5th hour can be observed. The suppression of E. coli at 5th hour should have no relation to hexane as the group treated with hexane grew extensively throughout the incubation period. In palmitic acid treated experimental groups, high concentrations caused significant lower bacteria growth, except P. aeruginosa compared to non-treated group. Especially at the 4th hour, the growth of B. subtilis and E. coli dramatically dropped after being treated with palmitic acid. E. coli treated with hexane showed significant difference compared with the one treated at 60 μg/mL. Although B. subtilis treated with hexane demonstrated no significant difference with its high concentration model, there was no sharp decrease in growth rate at certain time point. These two evidences support the positive action of palmitic acid on bacteria at high concentrations. From bacteria's perspective, S. aureus was found sensitive towards high concentration of eicosane, pentadecane and palmitic acid but at the same time hexane-treated S. aureus was found notably slower in rate of growth compared to non-treated group. Whereas E. coli and P. aeruginosa showed higher tolerance to hexane. To explain the contrasting effect of hexane towards both Gram positive and Gram negative bacteria, it was due to degree of organic solvent tolerance by bacteria. Cytoplasmic membranes are documented as the primary target of organic solvents to cause cellular damage. Gram negative bacteria contained an outer membrane which protects and permits quick adaptation by rearranging their fatty acid compositions, efflux pumps and LPS. Gram positive bacteria are lack of outer membrane protection. Unlike S. aureus, B. subtilis was not affected by hexane treatment in this case because there are few Gram positive bacteria such as Bacillus, Rhodococcus and Enterococcus species which demonstrated their exceptional tolerance towards organic solvent,,. Basically, S. aureus presented in this study was not affected by any of the sample treatments. The growth rate was increasing throughout the incubation time although there were significant suppresion compared to non-treated group. Unlike to B. subtilis and E. coli, S. aureus and P. aeruginosa were less sensitive to the treatment mainly due to the common defense by bacteria host, namely biofilm and also their high levels of resistance. Eicosane, pentadecane and palmitic acid may be not responsive enough to penetrate through the tough layer of biofilms. However, E. coli, P. aeruginosa and B. subtilis presented differently in disk diffusion, agar well diffusion and growth rate analysis. They shared similar phenomena whereby their growth rate encountered a decrease at certain time point but followed by increasing after the drugs treatment. Similar idea with enzyme mechanism, the concentration of drug may have exerted its killing or inhibiting properties to saturated phase. The ineffective clearance of bacteria continue to multiply and hence increase in growth rate can be observed. Overall, Eicosane and palmitic acid had better vision than pentadecane since the growth of B. subtilis, E. coli and P. aeruginosa experienced tackle to certain extent by eicosane and palmitic acid. Although the tested bacteria overcame from the combat of drugs treatment, the provisional effect of sample drugs towards the bacteria should not be neglected. Inflammation is one of the crucial phase in wound healing process. Inflammation is triggered by bacteria toxin such as LPS and IFN-γ. The action will release pro-inflammatory cytokines which drive the inflammation, chronic wound will occur if inflammation persists. Hence, an active compound which can override the inflammatory action is highly encouraged. This experiment was to investigate the potential of eicosane, pentadecane and palmitic acid in preventing the release of pro-inflammatory cytokines, TNF-α and IL-12. While both TNF-α and IL-12 in excess or otherwise, they are causative factor to chronic wound. Excessive level of TNF-α is believed to prolong inflammation and impair fibroblast activity. Furthermore, tissue destruction and impaired wound healing are often found in chronic TNF-α -associated diseases,. Meanwhile, IL-12 has high potency in regulating host immunity and anti-angiogenic activity,. All these facts make TNF-α and IL-12 target for stringent regulation. Under normal healing process, inflammation is self-limiting process. Meanwhile having its benefit in host defense system, if in excess, however, it limits wound healing. In the absence of effective decontamination based on the results, there is possibility for the pathogens to lead to a persistent release of pro-inflammatory cytokines such as TNF-α, thus promoting the wound into chronic state. In fact, IL-12 is responsible to maintain the reactivity and promote differentiation of T helper 1 cells (Th1) in which they associate the release of pro-inflammatory cytokines. There is a possibility of low infiltration of T cells concentration due to down-regulated IL-12. It leads to ineffective differentiation of CD4+ as well as CD8+ which in turn lead to chronic wound,. Although there were several findings that stated the negative impact of IL-12 deficiency, having downregulated IL-12 mRNA expression can prevent the anti-angiogenic activity in the later phase,. In wound healing, transition from inflammation into proliferation phase is a key step for downstream activities in wound healing. Early inflammation is essential to recruit macrophages for their phagocytosis action. As shown in the results, TNF-α and IL-12 were significantly downregulated after the treatment. Downregulation of IL-12 may cause impairment of Natural Killer cells cytotoxicity which in turn failed to eliminate pathogens. Phagocytosis of apoptotic Natural Killer cells is the central element that triggers the switch of phenotype from pro-inflammatory M1 to M2 macrophages and prohibits the phase of proliferation whereby this may be the plausible outcome when IL-12 is down-regulated,,. Besides, it has been suggested that palmitic acid ruptured cell membrane of fibroblast and interfered DNA integrity at high concentration, thus leading to cell death. In fact, results also showed that palmitic acid caused highest number of cell death and this result was compatible with the cytotoxicity test carried out by Ge et al.. In average, eicosane showed higher percentage of viable cells compared to pentadecane. Eicosane contained higher carbon sources that can be contributed in tricarboxylic acid cycle, an energy source compared to pentadecane, which probably explained the higher viability of HDF cultured in eicosane,. Based on the cytotoxicity and proliferation analysis, hexane was not a causative factor towards the outcome. Fibroblasts are the key cells that migrate from the wound edges across the damaged area, thereby healing the wound. Artificial wound scratches were to create a mimic damaged area across the monolayer. Loss of contact inhibition initiates the migration of fibroblast as shown in results. In notes, palmitic acid actually inhibits the migration of cells through dysregulation of Hippo-YAP signaling pathway. Hippo-YAP signaling pathway controls cells proliferation and migration through contact inhibition, this explains and supports that fibroblasts treated with high concentration of palmitic acid had lowest viability, proliferation and migration rate. By referring to previous results, incubation with respective drugs did not have positive impact on enhancing the proliferation and migration of fibroblasts. These phenomena strongly corresponded with the systematic flow of healing process described by Lee et al.. The authors explained the positive correlation between proliferation, migration and collagen synthesis processes. Hence, it is acceptable and reliable when there is no significant production of hydroxyproline by fibroblasts after treatments. Wound healing is a mandatory physiological process to restore the injured tissue back into its original orientation. It is critical to ensure the healing processes involved in orderly manner and any delays will impair the wound healing cascade. Eicosane, pentadecane and palmitic acid in this study had their evaluation in anti-microbial, anti-inflammatory, proliferation, migration and ability in collagen synthesis. They were deduced as not significant in reducing the bacterial load. Although there were significant results in downregulating the pro-inflammatory cytokines (TNF-α and IL-12), but the ineffectiveness in enhancing fibroblasts proliferation, migration and collagen synthesis summed up that eicosane, pentadecane and palmitic acid were not good candidates in facilitating wound healing. This project is supported by the Centre of Excellence for Research, Value, Innovation and Entrepreneurship Research Grant Scheme UCSI University (UCSI-CERVIE-RGS Proj-in-FAS 039). Thangapazham RL, Darling TN, Meyerle J. Alteration of skin properties with autologous dermal fibroblasts. Int J Mol Sci 2014; 15(5): 8407-8427. Elias PM, Feingold KR. Stratum corneum barrier function: Definitions and broad concepts. New York: Taylor & Francis; 2006, p. 1-4. Bouwstra JA, Pilgram GSK, Ponex M. Structure of the skin barrier. New York: Taylor & Francis; 2006, p. 65-96. Park K. Role of micronutrients in skin health and function. Biomol Ther (Seoul) 2015; 23(3): 207-217. Park K, Elias PM, Odam Y, Mackenzie D, Mauro T, Holleran WM, et al. Regulation of cathelicidin antimicrobial peptide expression by an endoplasmic reticulum (ER) stress signaling, vitamin D receptor-independent pathway. J Biol Chem 2011; 286(39): 34121-34130. Park K, Lee S, Lee YM. Sphingolipids and antimicrobial peptides: Function and roles in atopic dermatitis. Biomol Ther (Seoul) 2013; 21(4): 251-257. Orsted HL, Keast D, Lalande LF, Megie MF. Basic principles of wound healing. Wound Care Canada 2004; 9(2): 4-12. Diegelmann RF, Evans MC. Wound healing: An overview of acute, fibrotic and delayed healing. Front Biosci 2004; 9: 283-289. Moore AL, Marshall CD, Longaker MT. Minimizing skin scarring through biomaterial design. J Funct Biomater 2017; 8(1): 1-16. Eming SA, Martin P, Tomic-Canic M. Wound repair and regeneration: Mechanisms, signaling and translation. Sci Transl Med 2014; 6(265): 1-36.
de Oliveira S, Rosowski EE, Huttenlocher A. Neutrophil migration in infection and wound repair: Going forward in reverse. Nat Rev Immunol 2016; 16(6): 378-391. Segal AW. How neutrophils kill microbes. Annu Rev Immunol 2005; 23: 197-223. Wojtowicz AM, Oliveira S, Carlson MW, Zawadzka A, Rousseau CF, Baksh D. The importance of both fibroblasts and keratinocytes in a bilayered living cellular construct used in wound healing. Wound Repair Regen 2014; 22(2): 246-255. Bromberek BA, Enever PAJ, Shreiber DI, Caldwell MD, Tranquillo RT. Macrophages influence a competition of contact guidance and chemotaxis for fibroblast alignment in fibrin gel coculture assay. Exp Cell Res 2002; 275(2): 230-242.
de Oliveira Gonzalez AC, Costa TF, de Araujo Andrade Z, Peixoto Medrado ARA. Wound healing - A literature review. An Bras Dermatol 2016; 91(5): 614-620. Logsdon EA, Finley SD, Popel AS, Mac Gabhann. A systems biology view of blood vessel growth and remodeling. J Cell Mol Med 2014; 18(8): 1491-1508. Biswas TK, Mukherjee B. Plant medicines of indian origin for the wound healing activity: A review. Int J Low Extrem Wounds 2003; 2(1): 25-39. Choi H, Kim D, Kim JW, Ngadiran S, Sarmidi MR. Labisia pumila extract protects skin cells from photo aging caused by UVB irradiation. J Biosci Bioeng 2010; 109(3): 291-296. Karimi E, Jaafar HZE, Ahmad S. Antifungal, anti-inflammatory and cytotoxicity activities of three varieties of Labisia pumila Benth: From microwave obtained extracts. BMC Complement Altern Med 2013; 13(20): 1-10. Yff BTS, Lindsey KL, Taylor MB, Erasmus DG, Jager AK. The pharmacological screening of Pentanisia prunelloides and the isolation of antibacterial compound palmitic acid. J Ethnopharmacol 2002; 79(1): 101-107. Bylka W, Matlawska I, Franski R. Essential oil composition of Taraxacum officinale. Acta Physiol Plant 2010; 32(2): 231-234. Kumar Dwivedi B, Kumar S, Nayak C, Mehta BK. Gas chromatography mass spectrometry (GC-MS) analysis of the hexane and benzene extracts of the Piper betle (leaf stalk) (Family: Poperaceae) from India. J Med Plant Res 2010; 4(21): 2252-2255. Maggi F, Cecchini C, Cresci A, Coman MM, Tirillini B, Sagratini G, et al. Chemical composition and antimicrobial activity of Hypericum hircinum L. Subsp. majus essential oil. Chem Nat Compd 2010; 46(1): 125-129. Muleya E, Ahmed AS, Sipamla AM, Mtunzi FM, Mutatu W. Pharmacological properties of Pomaria sandersonii, Pentanisia prunelloides and Alepidea amatymbica extracts using in vitro assays. J Pharmacognosy Phytother 2015; 6(1): 1-8. Pretto JB, Cechinel-Filho V, Noldin VF, Sartori MRK, Isaias DEB, Cruz AB. Antimicrobial activity of fractions and compounds from Calophyllum brasiliense (Clusiaceae/Guttiferae). Z Naturforsch 2004; 9(10): 657-662. Abdulhadi FHS. Differentiation of U–937 monocytes to macrophage–like cells polarized into M1 or M2 phenotypes according to their specific environment: A study of morphology, cell viability, and cd markers of an in vitro model of human macrophages. Thesis. United State: Wright State University; 2014. Littlefield MJ, Teboul I, Voloshyna I, Reiss AB. Polarization of human THP-1 macrophages: Link between adenosine receptors, inflammation and lipid accumulation. Int J Immunol Immunother 2014; 1(1): 1-8. Xie C, Liu C, Wu B, Lin Y, Ma T, Xiong H, et al. Effects of IRF1 and IFN-β interaction on the M1 polarization of macrophages and its antitumor function. Int J Mol Med 2016; 38(1): 148-160. Ginzinger DG. Gene quantification using real-time quantification PCR: An emerging technology hits the mainstream. Exp Hematol 2002; 30(6): 503-512. Siddiqui AR, Bernstein JM. Chronic wound infection: Facts and controversies. Clin Dermatol 2010; 28(5): 519-526. Desbois AP, Smith VJ. Antibacterial free fatty acids: Activities, mechanisms of action and biotechnological potential. Appl Microbiol Biotechnol 2010; 85(6): 1629-1642. Desbois AP. Potential applications of antimicrobial fatty acids in medicine, agriculture and other industries. Recent Pat Antiinfect Drug Discov 2012; 7(2): 111-122. Zheng CJ, Yoo J, Lee T, Cho H, Kim Y, Kim W. Fatty acid synthesis is a target for antibacterial activity of unsaturated fatty acids. FEBS Lett 2005; 579(23): 5157-5162. Schoonhoven LM, Jermy T, van Loon JJA. Insect-plant biology: From physiology to evolution. London, UK: Chapman & Hall; 1998. Buschhaus C, Jetter R. Composition and physiological function of the wax layers coatng arabidopsis leaves: β -amyrin negatively affects the introcuticular water barrier. Plant Physiol 2012; 160(2): 1120-1129. Sikkema J, deBont JAM, Poolman B. Mechanisms of membrane toxicity of hydrocarbons. Microbiol Rev 1995; 59(2): 201-222. Ramos JL, Duque E, Gallegos MT, Godoy P, Ramos-Gonzalez MI, Rojas A, et al. Mechanisms of solvent tolerance in gram-negative bacteria. Annu Rev Microbiol 2002; 56: 743-768. Paje MLF, Nielan BA. Couperwhite I. A Rhodococcus species that thrives on medium saturated with liquid benzene. Microbiol 1997; 143(9): 2975-2981. Isken S, deBont JAM. Bacteria tolerant to organic solvents. Extremophiles 1998; 2(3): 229-238. Nielsen LE, Kadavy DR, Rajagopal S, Drijber R, Nickerson KW. Survey of extreme solvent tolerance in gram-positive cocci: Membrane fatty acid changes in Staphyloccocus haemolyticus grown in toluene. Appl Environ Microbiol 2005; 71(9): 5171-5176. Zhou G, Shi Q, Huang X, Xie X. The three bacterial lines of defense against antimicrobial agents. Int J Mol Sci 2015; 16(9): 21711-21733. DeLeon S, Clinton A, Fowler H, Everett J, Horswill AR, Rumbaugh KP. Synergistic interactions of Pseudomonas aeruginosa and Staphylococcus aureus in an in vitro wound model. Infect Immun 2014; 82(11): 4718-4728. Wakshlak RBK, Pedahzur R, Avnir D. Antibacterial activity of silverkilled bacteria: The “zombies” effect. Sci Rep 2015; 5(9555): 1-5. Klimiuk PA, Sierakowski S, Domyslawska I, Chwiecko J. Effect of repeated infliximab therapy on serum matrix metalloproteinases and tissue inhibitors of metalloproteinases in patients with rheumatoid arthritis. J Rheumatol 2004; 31(2): 238-242. Siqueira MF, Li J, Chehab L, Desta T, Chino T, Krothpali N, et al. Impaired wound healing in mouse models of diabetes is mediated by TNF-α dysregulation and associated with enhanced activation of forkhead box O1 (FOXO1). Diabetologia 2010; 53(2): 378-388. Matias MAT, Saunus JM, Ivanovski S, Walsh LJ, Farah CS. Accelerated wound healing phenotype in interleukin 12/23 deficient mice. J Inflam 2011; 8(39): 1-11. Teng MWL, Bowman EP, McElwee JJ, Smyth MJ, Casanova JL, Cooper AM, et al. IL-12 and IL-23 cytokines: From discovery to targeted therapies for immune-mediated inflammatory diseases. Nat Med 2015; 21(7): 719-729. Menke NB, Ward KR, Witten TM, Bonchev DG, Diegelmann RF. Impaired wound healing. Clin Dermatol 2007; 25(1): 19-25. Kim TS, Kang BY, Lee MH, Choe YK, Hwang SY. Inhibition of interleukin-12 production by auranofin, an anti-rhematic gold compound, deviates CD4+ T cells from the Th1 to the Th2 pathway. Br J Pharmacol 2001; 134(3): 571-578. Swift ME, Burns AL, Gray KL, DiPietro LA. Age-related alterations in the inflammatory response to dermal injury. J Invest Dermatol 2001; 117(5): 1027-1035. Park JE, Barbul A. Understanding the role of immune regulation in wound healing. Am J Surg 2004; 187(5A): 11-16. Voest EE, Kenyon BM, O’Reilly MS, Truitt G, D’Amato RJ, Folkman J. Inhibition of angiogenesis in vivo by interleukin 12. J Natl Cancer Inst 1995; 87(8): 581-586. Bielawska-Pohl A, Blesson S, Benlalam H, Trenado A, Opolon P, Bawa O, et al. The anti-angiogenic activity of IL-12 is increased in iNOS-/-mice and involves NK cells. J Mol Med (Berl) 2010; 88(8): 775-784. Scelza MZ, Coil J, Alves GG. Effect of time of extraction on the biocompatibility of endodontic sealers with primary human fibroblasts. Braz Oral Res 2012; 26(5): 424-430. Odabas ME, Erturk M, Cinar C, Tuzuner T, Tulinoglu O. Cytotoxicity of a new hemostatic agent on human pulp fibroblasts in vitro. Med Oral Patol Oral Cir Bucal 2011; 16: 584-587. Dateoka S, Ohnishi Y, Kakudo K. Effects of CRM197, a specific inhibitor of HB-EGF, in oral cancer. Med Mol Morph 2012; 45(2): 91-97. Harris MO, Corcoran J. Toxicological profile for n-hexane. Agency for Toxic Substances and Disease Registry, U.S. Department of Health and Human Services, Public Health Service; 1999. Magdalon J, Hatanaka E, Romanatto T, Rodrigues HG, Kuwabara WMT, Scaife C, et al. A proteomic analysis of the functional effects of fatty acids in NIH 3T3 fibroblasts. Lipids Health Dis 2011; 10(218): 1-8.
de Lima TM, Cury-Boaventura MF, Giannocco G, Nunes MT, Curi R. Comparative toxicity of fatty acids on a macrophage cell line (J774). Clin Sci 2006; 111(5): 307-317. Lemons JMS, Feng XJ, Bennett BD, Legesse-Miller A, Johnson EL, Raitman I, et al. Quiescent fibroblasts exhibit high metabolic activity. PLoS Biol 2010; 8(10): 1-16. Zhang J, Nuebel E, Wisidagama DRR, Setoguchi K, Hong JS, van Horn CM, et al. Measuring energy metabolism in cultured cells, including human pluripotent stem cells and differentiated cells. Nat Protoc 2012; 7(6): 1-37. Topham NJ, Hewitt EW. Natural killer cell cytotoxicity: How do they pull the trigger? Immunol 2009; 128(1): 7-15. Bak RO, Mikkelsen JG. Regulation of cytokines by small RNAs during skin inflammation. J Biomed Sci Eng 2010; 17(53): 1-19. Landen NX, Li D, Stahle M. Transition from inflammation to proliferation: A critical step during wound healing. Cell Mol Life Sci 2016; 73(20): 3861-3885. Hesketh M, Sahin KB, West ZE, Murray RZ. Macrophage phenotypes regulate scar formation and chronic wound healing. Int J Mol Sci 2017; 18(7): 1-10. Ge L, Gordon JS, Hsuan C, Stenn L, Prouty SM. Identification of the delta-6 desaturase of human sebaceous glands: Expression and enzyme activity. J Invest Detmatol 2003; 120(5): 707-714. Yuan LS, Mao Y, Luo W, Wu W, Xu H, Wang XL, et al. Palmitic acid dysregulates the Hippo-YAP Pathway and inhibits angiogenesis by inducing mitochondrial damage and activating the cytosolic DNA sensor cGAS-STING-IRF3 signaling. J Biol Chem 2017; 292: 15002-15015. Murthy S, Gautam MK, Goel S, Purohit V, Sharma H, Goel RK. Evaluation of in vivo wound healing activity of Bacopa monniera on different wound model in rats. Biomed Res Int 2013; 2013(2013): 1-9. Cartron ML, England SR, Chiriac AL, Josten M, Turner R, Rauter Y, et al. Bactericidal activity of the human skin fatty acid cis-6-hexadecanoic acid on Staphylococcus aureus. Antimicrob Agents Chemothr 2014; 58(7): 3599-3609. Caetano GF, Fronza M, Leite MN, Gomes A, Cipriani F. Comparison of collagen content in skin wounds evaluated by biochemical assay and by computer-aided histomorphometric analysis. Pharm Biol 2016; 54(11): 2555-2559. Lee DH, Choi KH, Cho JW, Kim SY, Kwon TR, Choi SY, et al. Recombinant growth factor mixtures induce cell cycle progression and the upregulation of type I collagen in human skin fibroblasts, resulting in the acceleration of wound healing processes. Int J Mol Med 2014; 33(5): 1147-1152.